This is a continuation of my blog from yesterday, so I suggest you read that first. 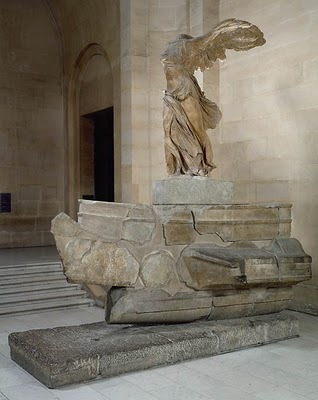 One of the things I’ve been working on the past month is creating a photogrammetric model of monuments using nothing but tourists’ photographs. 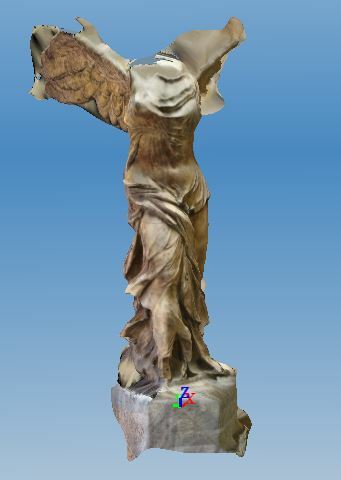 After many attempts my last test, using the Winged Victory of Samothrace as a model, seemed to have sufficiently good results, so much that I decided to analyse the image data to pinpoint what kind of photographs actually stitch together in 123D Catch, and which ones give problems. This way we can actually choose a limited amount of good photographs, rather than a vast number of mixed ones. In order to understand the patterns behind the stitching mechanism, I created an Excel file in which I included all images with certain details: width and height, if the background is consistent with the majority of the photographs, if the colour is consistent, if the lighting is the same, the file size, and the position of the object. The last one is based on the idea that to make 3d models we need series of shots from 8 positions, each at 45 degrees angle from one another. If we are thinking of it like a compass, with North corresponding to the back of the object, position 1 is South, 2 is SW, 3 is W, and so on up to 8 is SE. The first thing I noticed, which ties in with what said yesterday, is the lack of photographs in positions 4 and 6 (NW and NE), which of course meant that all the images from the back (position 5) also had trouble stitching. Therefore the first problem for the model is the need of enough images from all angles, without which it is inevitable to have missing parts. This is made harder by the fact that these are typically positions that are not photographed. Having concluded that images from position 4-5-6 had this reason for not stitching, I removed them from the list so the data would be more accurate for the others. I then averaged the height, width and file size of the stitched images and those of the unstitched images and then compared them. The former had an average height of 1205.31, a width of 906.57 and a file size of 526.26, while the latter had a height of 929.07, a width of 668.57 and a file size of 452.57. The differences here are enough to suggest that large good quality images have a higher chance of being stitched. This may seem obvious, but actually some images that have not stitched are larger and higher quality than some which have, so this can’t be the only factor. Also, the difference isn’t large enough to suggest it is even a key factor. The next step was analysing the percentage of stitched images that had abnormal background, colour and lighting to the unstitched ones, which had even more limited results. In the former, the background was not constant in 15% of the images, the colour in 63% and the lighting in 47%, while in the latter background was 0%, colour was 50% and lighting 50%. Somehow these results show that the photographs have a higher chance of being included if they are different from the rest, which goes against all the knowledge we have up to now of 123D Catch. I therefore suspect that the program allows a good tolerance when it comes to these elements, and that I may have been to harsh in defining the differences in these elements. 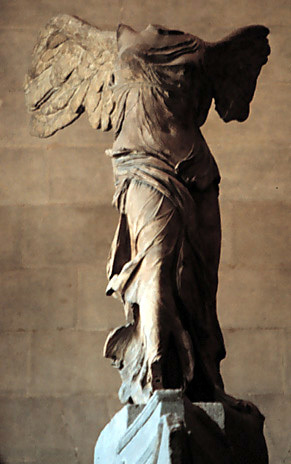 Distant shots: Some photographs were taken at a further distance from the statue than others, and while a certain degree of variation is acceptable, in these it was too extreme. Excessive shadows: Although as we’ve seen before the lighting didn’t appear to be a factor, some of the images had an extreme contrast, with very unnatural light. They were practically at the edge of the scale, and while some variation is acceptable, these were well beyond that. Background: this is an interesting case in which the background is not different rom the rest, but has a very similar colour to the rest of the object. Because of the similarities it is difficult for the program to recognise any edges, which makes it impossible to be stitched correctly. Therefore creating 3d models from tourists’ photographs is entirely possible, as long as we have sufficient angles, photographs from a similar distance, without harsh lighting and with a contrasting background. 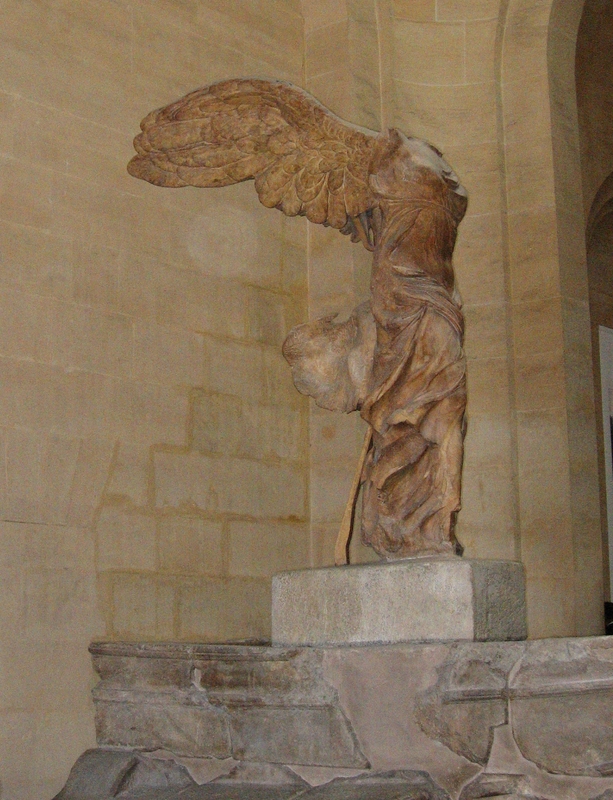 The Winged Victory of Samothrace Reconstructed Digitally Using Tourists’ Photographs.